Our guide to Albuquerque will help you find the best budget hotels in Albuquerque New Mexico. At first glance, Albuquerque appears to be a typical Sun Belt city, stretching out more than 100 square mi with no grand design, architectural or otherwise, to hold it together. The city's growth pattern seems as free-spirited as all those hot-air balloons that take part in the Albuquerque International Balloon Fiesta every October. With a bit of exploration, however, this initial impression of an asphalt maze softens as you get a sense of Albuquerque's distinctive neighborhoods. The charms of Albuquerque may not jump out to greet you, but the blend of Spanish, Mexican, Native American, Anglo, and Asian influences makes this a vibrant multicultural metropolis well worth exploring. In fact, the city's most distinctive components -- first-rate museums and performing arts venues; well-preserved Spanish-colonial, Victorian, and art deco architecture; both sophisticated and funky restaurants and B&Bs; and offbeat shops and galleries -- measure up to those you'd find in most U.S. cities this size. You just have to persevere beyond the suburban sprawl and strip-mall excess to find all the good stuff. There are tons of great budget hotels in the city of Albuquerque, our city guide will help you find the best budget hotels. You may have a hard time deciding what to do in Albuquerque, but we make your decision easy. 1015 Rio Grande Blvd NW, (505) 843-9500 - Best Western Rio Grande Inn is a budget hotel / motel / resort located in Albuquerque NM. 13031 Central Ave NE, (505) 294-1800 - Comfort Inn East is a budget hotel / motel / resort located in Albuquerque NM. 13139 Central Ave NE, (505) 292-4878 - Budget Host is a budget hotel / motel / resort located in Albuquerque NM. 1350 Sunport Pl SE, (505) 338-3900 - Staybridge Suites-Albuquerque is a budget hotel / motel / resort located in Albuquerque NM. 1400 Sunport Blvd SE, (505) 242-9300 - AmeriSuites Albuquerque Airport is a budget hotel / motel / resort located in Albuquerque NM. 1760 Menaul Blvd NE, (505) 889-4000 - Fairfield Inn Albuquerque University Area is a budget hotel / motel / resort located in Albuquerque NM. 1801 Yale Blvd SE, (505) 242-0036 - Ramada-Limited is a budget hotel / motel / resort located in Albuquerque NM. 1901 University Blvd SE, (800) 522-1555 - Vagabond Inn Executive Albuquerque is a budget hotel / motel / resort located in Albuquerque NM. 201 Marquette Ave NW, (505) 247-3344 - Doubletree-Albuquerque is a budget hotel / motel / resort located in Albuquerque NM. 2011 Menaul Blvd NE, (505) 761-5600 - La Quinta Inn & Suites Albuquerque Midtown is a budget hotel / motel / resort located in Albuquerque NM. 2300 12th St NW, (877) 863-4780 - Holiday Inn Express & Suites Historic is a budget hotel / motel / resort located in Albuquerque NM. 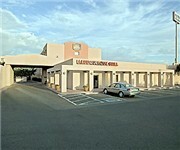 2300 International Ave SE, (505) 244-3325 - Sleep Inn Airport is a budget hotel / motel / resort located in Albuquerque NM. 2300 Yale Blvd, (505) 243-2244 - Comfort Inn is a budget hotel / motel / resort located in Albuquerque NM. 2400 Yale Blvd SE, (505) 242-7022 - Airport Albuquerque Best Western Innsuites Hotel & Suites is a budget hotel / motel / resort located in Albuquerque NM. 2401 Wellesley Dr NE, (505) 883-8888 - Suburban Extended Stay is a budget hotel / motel / resort located in Albuquerque NM. 2402 Central Ave SW, (505) 243-3554 - Monterey Motel is a budget hotel / motel / resort located in Albuquerque NM. 2412 Carlisle Blvd NE, (505) 880-0080 - Econo Lodge Midtown is a budget hotel / motel / resort located in Albuquerque NM. There are plenty more budget hotels in Albuquerque. See all budget hotels in Albuquerque New Mexico.